I LOVE reading blogs. I love to see what fellow-bloggers bring to the table with their creativity, their skills and their lifelong journeys. Someday I’ll do the top 10 blogs I love reading post as well but for now I can safely say that the list is nowhere near only 10 and it grows every day. No doubt some fellow bloggers, whether they’re in the lifestyle niche, or the mommyhood niche or in the fashion niche, have worked really hard on how their blog stands out. I mean – their blogs are dropdead gorgeous. The effort is instantly visible and it just makes you wonder how they came up with so many gorgeous ideas in the first place. A lot of blogs I run into aren’t visually pleasing. Don’t get me wrong, they are decent looking with a color-palette and some nice chic images but the structure and the consistency throughout the blog can’t be found. For a Web Designer like me, it’s almost heart-breaking because those very same blogs have got some amazing content on there! 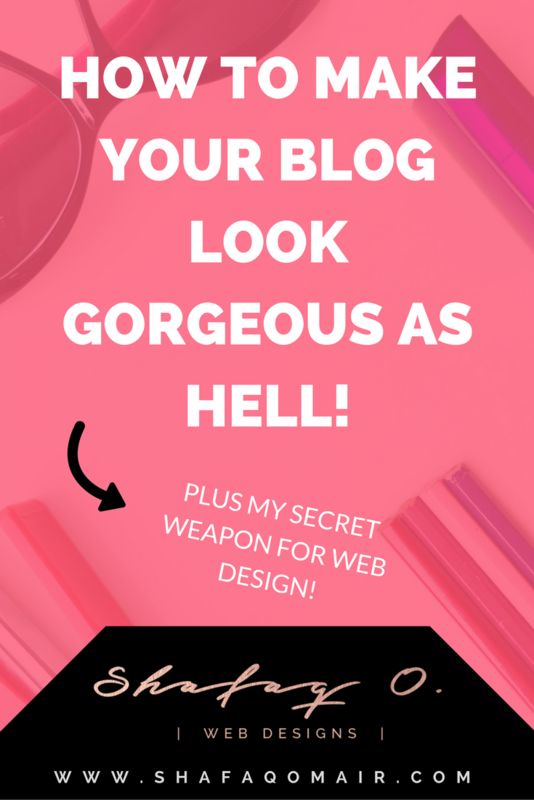 So what’s my secret weapon for Web Design?! My number one recommendation for beginners is WordPress (WordPress.org not WordPress.com) and if you know a thing or two about website builders, my number one would be Divi from Elegant Themes. I have also heard raves about squarespace websites these days because the platform takes out the frustration of “building a site” and I have heard bloggers are able to focus on their blogging then maintaining their sites with this platform. I am yet to try it out but do give it a look. However, if you have made up your mind about WordPress and the magic it brings, keep reading! How to make your blog look gorgeous on the internet, and I hope (really hope) everyone benefits from this! Web designing starts off exactly the same way blogging does – by defining a niche. Who is going to land on your blog and what would they like to see? Who are you and how would you like to show yourself through your site? These are some of the important questions you should be asking yourself when you start building you site. More on this in the next point! What is a mood board? It is a document where you add all things inspiring for your new website. How do you create one? There are two ways to do this. We use all kinds of images for our blogs and it’s okay to post free / reflective images on your individual posts but when it comes to your homepage, headers and main identity of your website / blog, you need to get serious about it! The most amazing of websites either do their own photography or purchase high quality stock photos. There are websites where you can buy stock photos for as low as $5. If you can invest well in your logo, brand then why not invest in your images too? After all, they’ll reflect your brand entirely from the get-go! If you don’t want to pay for a lot of images for your entire site, buy just one. For example, for Vogue Web Ventures I took the header shot myself but for my Work Website, Vogue Web Studios, I couldn’t come up with an idea for the theme so I found one image and bought it off a Stock Marketplace. One image – $20 – no big deal for my money making venue! Assuming you have no design experience whatsoever, you need to buy a theme. However, I have also read from a lot of experts that Squarespace is like WordPress.com and NOT websites that are built with WordPress.org. Don’t know the difference? Read here! For WordPress (DOT ORG) lovers, I highly recommend a website builder instead of a theme, DIVI, solely because it is exceptionally easy to use and learn (it does come with various free readymade layouts for you to use), but if you have no design experience, I’d suggest to find a theme with placeholder content and start filling in! Warning: Do not think that if a theme is visually appealing, it will look good with your brand, find a theme specific to your niche and most importantly, find a theme that will not make you cry at the end of the day because it is hard to customize. Check Documentation and the Set up process! Say you have a few websites you love looking at and you’re inspired to create one along the same lines but don’t know anything on how those websites were built, invest in a designer and let that person do it for you. Unless you fall into the hands of a foul designer, you won’t regret the decision. It’s a win-win situation, because you get professional help and you get an awesome site that you can devour for the rest of your – online life. Let’s start from the beginning. You have zero design experience and you need to create a website for your brand. You have a rough idea about how you want it to look like but no final design. And you want to build the whole thing yourself – on WordPress – no Squarespace. My suggestion would be to use the concept of building blocks. Do not look at a flashy site and try copying the style, you will end up wasting a lot of time and in worse case scenarios, a lot of money too. I personally love a lot of white space and a new trend (for the better) among websites these days is that they heavily prefer to keep the majority area of their sites and blogs white. Some websites have made a bunch of colors work for them, like Allison’s Wonderlass, because they know exactly how they want their websites to look like. And do notice all the white space present on her site too. But if you are using an enormous amount of Reds, Blues and Greens or love to colorcode, don’t design your website yourself. Ideally pick three colors to start with. I like to use two base colors (from the logo) and one color to speak up. So if the branding is black and white, I’d add a touch of pink/turquoise/yellow to it. If the branding is pink, I’d use a lot of white with either black or a complementary color to go along with pink or just keep it to the white. If the branding has three colors like orange, blue and brown (absurd I know), I’d limited myself to show off some visuals in those color palettes for headers and footers but keep the rest of the site minimal with a white background. Every handwritten font goes amazing with a straight (Sans Serif or Slab Serif) font. The shots I added to this blog are sites I have created myself. Hope you find everything helpful and leave a comment to let me know if you want me to add to this list or have a question in mind!